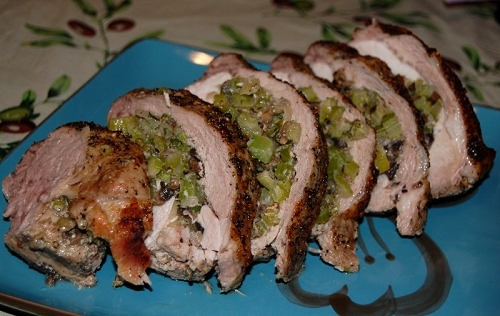 Stuffed Flank steak or Pork loin is an exceptional meat that is inexpensive and easy to prepare. This recipe is simmered with a warm stuffing then served with sour cream gravy. Cook onion in the butter until tender. Stir in chopped eggs, 1/4 cup of the sour cream, croutons, water, and the beaten egg. Pound steak to thin and tenderize; sprinkle with Jake's Chicken Rub formerly Seasoned salt and pepper. Spread stuffing over the meat; roll up from wide edge then skewer to secure. Brown the roll in a large skillet in the hot oil. Add 1/2 cup water, cover, and simmer for 1 1/2 hours, or until tender. Remove meat roll and add enough water to the drippings to make 1/2 cup. Stir in remaining sour cream. Heat just to boiling point; serve with meat. Herb Pork or Flank Steak Recipe serves 4.